Luke Pomersbach of the Kings XI Punjab is run out by Herschelle Gibbs of Deccan Chargers during the Indian Premier League (IPL) T20 match in Johannesburg on Sunday. 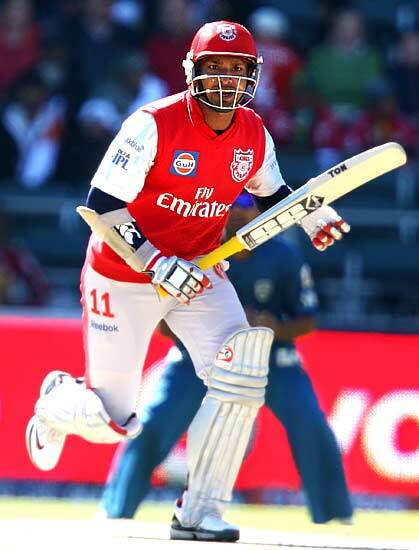 Yuvraj Singh walks back to the pavillion after being cleaned bowled by Venugopal Rao for 20 runs. Kumar Sangakkara completes a run during his knock of 56 off 43 deliveries. Sangakkara, who struck five fours and a six in his quickfire 56-run innings, stitched a crucial 53-run partnership with Wilkin Mota (12) to guide Punjab to a descent score of 134. Wicketkeeper Kumar Sangakkara whips off the bails in a flash to stump Andrew Symonds for 25. Opener Gibbs departed to the last delivery of the first over after the strategy break when his powerful cut off Yuvraj's delivery saw Piyush Chawla at backward point pouch a sharp catch. Yuvraj sizzled again in his next over, sending the dangerous-looking Symonds (25 off 25) packing, Sangakkara first fumbling with the ball before effecting a brilliant stumping. The bowler's next delivery then disturbed Rao's (0) stumps. It gave the left-arm spinner his second hat-trick in the Twenty20 event, the first coming against Royal Challengers Bangalore. Sangakkara and Yuvraj exult after the dismissal of Symonds. The dismissal got Yuvraj on the verge of claiming his second hat-trick of the tournament. 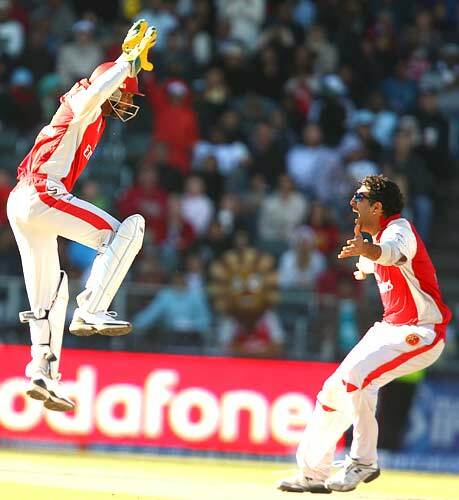 S Sreesanth and Irfan Pathan celebrate after winning the match. 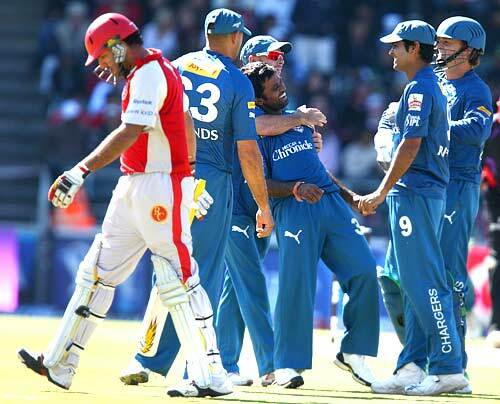 Pathan dismissed Rohit Sharma and R P Singh in the final over of the match to assure a 1 run victory over Hyderabad.